DSC_0607, originally uploaded by dogseat. 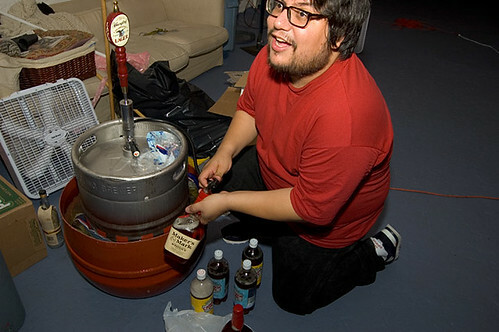 My friend Eric was the preacher for his roomates wedding and after ther party had a Keg and a half left. He sent out a call for help from the locals to bring empty bottles to emty out the rest. I came over with bottles; two makers, a Basil haden and 4 – 1 liter soda bottles. I’ve been drinking beer for the past few days. life is good. Lounge, you look so happy! Beer is your “Happy Place”! Lugo told me once that strangers touched him in his “Happy Place”… Now I know what he meant.